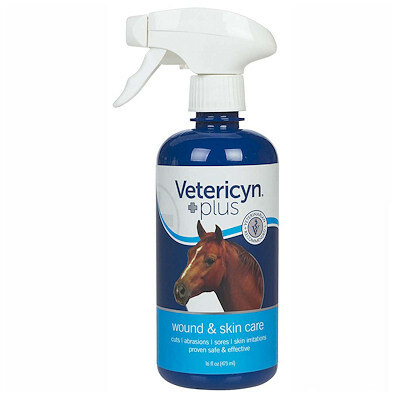 Vetericyn Plus Wound & Skin Care 16 ounce Liquid Spray for use on horses, dogs, cat and safe for all animal species. It is formulated to clean and debride wounds, cuts, abrassions, rashes, sores and skin irritations. In using Vetericyn Plus remove excess hair and saturate the affected area. If a wound dressing is required, saturate the dressing at each dressing change. Repeat 3 - 4 times daily until the wound has healed. Vetericyn Plus is safe for use around eyes, ears, nose and mouth. Shake well before using.